Prepared with assistance from the Australian Agency for International Development (AusAID) through the Local Governance Development Program (LGDP), the Bohol Integrated Water Supply System Master Plan for 2010 to 2035 contains data on future water demand requirements and potential water sources, recommended strategies for province-wide water sustainability, policy intervention and institutionalization, a province-wide watershed management framework for the province of Bohol (PWMFB), a capacity development framework, mainstreaming gender and development (GAD), management information system, marketing plan, and a monitoring and evaluation plan. 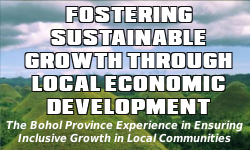 Includes plans for tapping the seven major rivers of the province, namely, Abatan, Loboc 1 and 2, Manaba, Carood, Ipil and Wahig- Inabanga with the province’s 47 municipalities and city grouped by river basin. 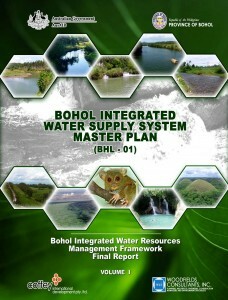 Serves as guide in the development of Bohol’s water resources for safe domestic, commercial and industrial use. Updated at least once every 5 years. thank you very much for your free downloadable documents and maps. they are very useful for our project making. we were making a feasibility study in our subject as 5th year mechanical students of BISU-MC. the feasibility study is about designing an industrial plant here in Bohol and asses its feasibility. the maps have helped us a lot to find a suitable location for our industrial plant. even though this is a school project, we are serious about this to practice profesionalism in our work. the information in your website has given us reliable information. thank you very much. Good day. I tried downloading Volume 2 of the report, but whenever I try to unzip it, it tells me that the file is corrupted. can you help me? Hi, I downloaded the Volume 2 just a minute ago and it opened fine. Sometimes files get corrupted when downloaded through an unstable internet connection, especially that the file is quite large. Try downloading it again. When downloading a large file, it is also good to use a download manager so that your download will safely continue when interrupted. Hi, thank you for making the files available online. I am downloading BIWSSMP Vol1. I found out that Chapter 1 – Introduction is missing. Is there another file leading to Chapter 1? Thank you. Thanks for the heads-up. We updated the file and it should be right, now. Please re-download.